SPOILER WARNING! Photo and subsequent comments will contain spoilers. 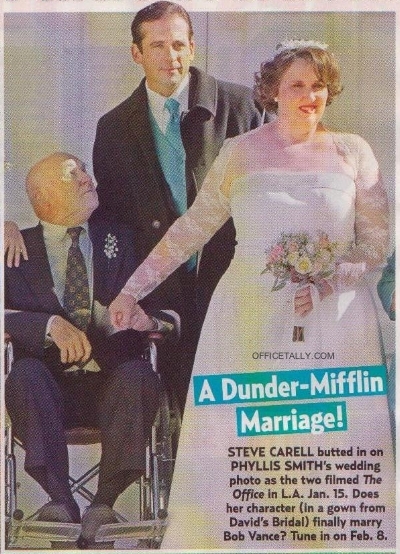 Here’s the first of, I’m sure, many photos we’ll be seeing from the upcoming episode, Phyllis’ Wedding. This is a scan from the latest issue of US Weekly. What an awesome photo–can’t wait for the episode! Heh… gotta love the teal blue. Can’t wait to see everyone else. Especially after what Kate wrote on her TVguide blog. ;-) Get ready for some shoulder pads! But Phyllis looks pretty. I have a feeling Jim is going to be looking very hot! Yay! Please, Powers That Be, let Michael calm his ADD for one day so that Phyllis can have a good wedding. And so Bob Vance doesn’t call Michael a “mary” before beating him up. I think Michael might actually pull it off and be a good, supportive guy – instead of making Phyllis feel like the senior (“we’re the same age”). Phyllis looks great. My one problem is the caption. Couldn’t they have added a little more space, so they could say “Bob Vance, Vance Refrigeration”? You know that every true Office flan is going to have to add that for themselves. She looks so pretty! I can’t wait for this episode to air. haha, i used to work at david’s bridal and recognized the dress before i read the side bar! michael’s tux is from after hours formal and it’s in the color pool. Why is her marriage a question? Could something go wrong at the wedding…? Carell recently looks like he has had eye work done. He seems to look younger than he did 2 years ago. Well I don’t know about the eye work, DrunkBiking, but the fact that Carell looks younger might be because he’s lost a lot of weight since season one. Like 30 or 40lbs, I think. “shez” is right… he just lost a lot of weight. he looks really good! can’t wait for this episode. it’s bound to have some great michael moments as well as jam moments, too! Ah, that’s probably it then shez. Awwwww haha when I saw this in Us Weekly I was like, HUH!?? It’s so crazy that The Office has become such a big thing-it now has these high profile wedding episodes! –and pictures in Us Weekly ahhh! They say, “will her character FINALLY marry Bob Vance”, but they haven’t really been dating THAT long have they? I mean, what a year-two maybe?